Approved for SmartWaySM-certified tractors and meets California's CARB requirements. 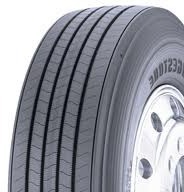 Innovative tread design, casing and advanced tread compounds for reduced rolling resistance for superior fuel efficiency. Defense Groove™ feature combats the initiation and spread of irregular wear. Sidewall protectors on both sidewalls fight damage from curbing.